You need your immune system working at its best all the time. That's why there's Ester-C, The Better Vitamin C.
Ester-C is a unique, exclusive form of buffered Vitamin C providing you with antioxidants and immune system support. Ester-C also helps in the development and maintenance of bones, teeth, gums, and skin. Ester-C is non-acidic and stomach friendly, so you can take it all year long. After all, you don't want your immune system unsupported when you need it most. 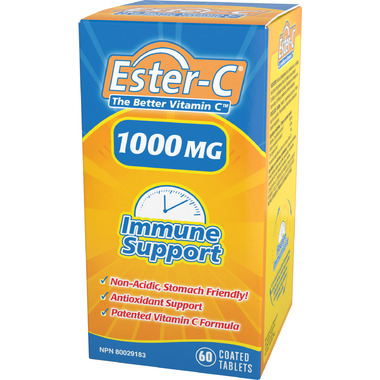 Take Ester-C every day and you will "C" the difference! This is a non-acid formula. Once a day keep the doctor away. Excellent product. I think it's important to take extra vitamins in the winter with our damp and hard climate. It's so easy to shop on Well.ca and the service is excellent. I am recommending it to everyone I know. Thank you! This vitamins are excellent, I've being taking them for a few years now and never had any problems. I found out when I got home that the caplets are made with wheat flower, and they were causing me a reaction. I've only recently noticed my gluten intolerance, so am not used to checking so carefully. Now I have two bottles of this that I cannot use. Beware if you can't tolerate gluten this is NOT the way for you to get Vitamin C! As I am suffering from GERD, my doctor advised that I take Ester-C that will not turn acidic in the stomach. I have been taking Ester-C 1000 mg. for so many years and find that it helps not only in preventing infections but also maintain my good complexion. Will continue to use it forever..